Thinking about summer holidays? Now is a great time to book the kids into swimming lessons to make sure they get the most out of the pool and stay safe on holiday. Today Katie is still director of�Water Nippers�and still hands on; she can often be found teaching in the pool as well as working hard in the office to ensure your Water Nippers’ experience runs as smoothly as possible. "Our classes are small and held in warm pools, which is particularly appealing to babies and toddlers, not to mention parents,” explains Katie. "All swimming instructors are STA and/or ASA qualified and will also hold a rescue test certificate. In addition, each teacher will have received training with�Water Nippers�and will be skilled at handling your child under and above the water." 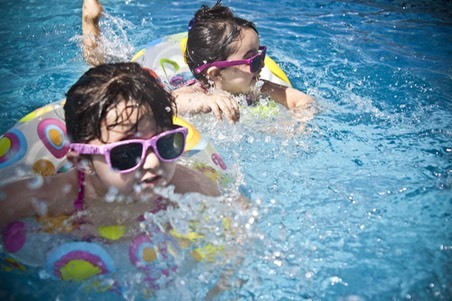 "As a general rule of thumb, one parent (Mum, Dad, or other responsible adult known to your child) will accompany one child in the water until that child is around three years old,” says Katie. "Children aged three and over will generally be placed in classes without parents. However, we encourage parents to watch poolside if you wish." Toddlers are taught important life saving skills as well as basic swimming strokes. "We start the basic principles of doggy paddle, free style or breast stroke, back stroke and diving all before the age of three,” says Katie. "We have many children aged between two and three who are able to swim five metres unaided to their parents." Once children are aged three and over Katie and her team work to improve their technique and stamina, whilst encouraging them to go underwater and even dive down to the bottom of the pool independently. Book your child onto a Water Nippers Swimming course: Call 01273 621 333 or email today. Read Local Mums’ reviews of Water Nippers swimming lessons.